Goshen’s focus on the fine arts is rooted in the belief that participation in performing and visual arts inspires students’ creativity, problem-solving and critical thinking skills. 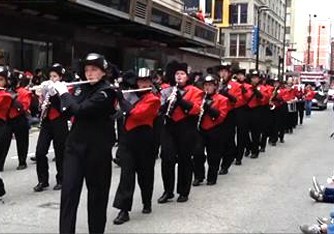 The Goshen High School marching band performs in every Findley Market Opening Day Parade. All students are assessed for talents in the artistic areas and offered enrichment opportunities, including yearly musicals, band, recorder musical performances, and talent shows. Many students showcased and published in a poetry contest hosted by Young America Poetry Digest every year. Goshen High School Marching Band and Show Choir performed at Disney World in February of 2018. Goshen High School Choir annually performs the National Anthem at the Cincinnati Cyclones Game. Goshen students from across the district are showcased in the annual Fine Arts Night. GHS students go on to major in arts and theater at colleges and universities across the country every year.